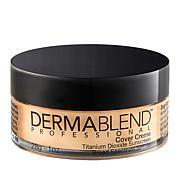 Nobody's perfect ... fake a flawless complexion with professional grade cover creme from Dermablend. Designed to provide maximum coverage, this lightweight and creamy formula is ideal for concealing scars, bruises, even tattoo's so you can cover up your imperfections with ease. Copyright © 1999 - 2013 HSN Interactive LLC. HSN and HSN.com are registered trademarks of HSNi, LLC. 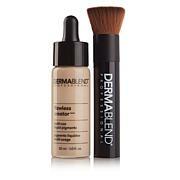 This product makes acne scarred, red skin look polished. The setting powder isn't necessary but it is useful to make the finish last a very long time. I'm so glad to have found something for my bad skin! 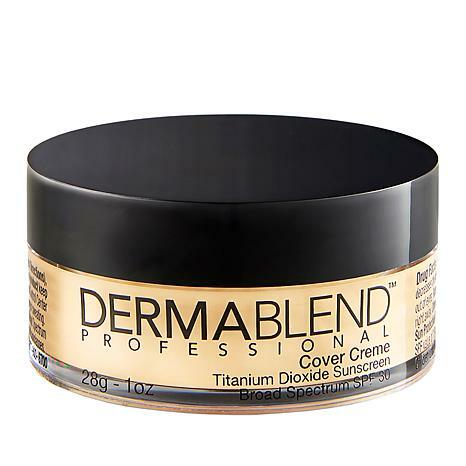 This cover creme is wonderful. It matches my skin color almost exactly, and hides the many flaws and blotches on my skin. It is not sheer, but a true foundation base. 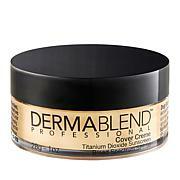 DermaBlend gives a flawless finish even on my aging complexion. Have received complements from friends. Works fine on oily skin. At the end of the day the product stays put even after using oil blotting tissue and looks fresh and pleasing. You will need the setting powder followed by a damp paper towel to set the finish to make this last comfortably all day. Otherwise it would be too gooey on your skin. It didnt cover my freckles so I find it hard to believe it would cover birthmarks. This product is very effective in covering the scars aound my left eye area (due to a bout with shingles). It covers much better than some of the previous products I have tried. Remind me about Dermablend upcoming shows.